An unwavering focus on shareholder rights and our commitment to excellence makes the Firm an inspiring place to practice law. Danielle Myers is a partner in Robbins Geller Rudman & Dowd LLP’s San Diego office and focuses her practice on complex securities litigation. 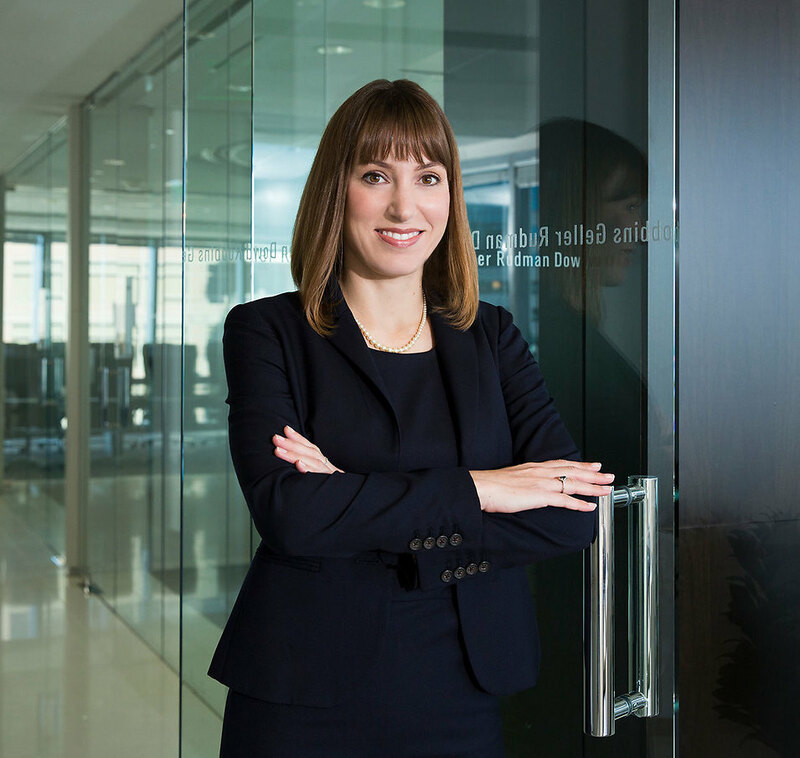 Danielle is one of the partners that oversees the Portfolio Monitoring Program® and provides legal recommendations to the Firm’s institutional investor clients on their options to maximize recoveries in securities litigation, both within the United States and internationally, from inception to settlement. In addition, Danielle advises the Firm’s clients in connection with lead plaintiff applications and has secured appointment of the Firm’s clients as lead plaintiff in over 100 cases, including Knurr v. Orbital ATK, Inc., No. 1:16-cv-01031 (E.D. Va.), Evellard v. LendingClub Corp., No. 3:16-cv-02627 (N.D. Cal. ), In re Plains All American Pipeline, L.P. Sec. Litig., No. 4:15-cv-02404 (S.D. Tex. ), Marcus v. J.C. Penney Co., Inc., No. 6:13-cv-00736 (E.D. Tex. ), In re Hot Topic, Inc. Sec. Litig., No. 2:13-cv-02939 (C.D. Cal. ), Smilovits v. First Solar, Inc., No. 2:12-cv-00555 (D. Ariz.), and In re Goldman Sachs Grp., Inc. Sec. Litig., No. 1:10-cv-03461 (S.D.N.Y.). Danielle has obtained significant recoveries for shareholders in several cases, including: Marcus v. J.C. Penney Co., Inc., No. 13-cv-00736 (E.D. Tex.) ($97.5 million recovery); In re Hot Topic, Inc. Sec. Litig., No. 2:13-cv-02939 (C.D. Cal.) ($14.9 million recovery); Genesee Cty. Emps.’ Ret. Sys. v. Thornburg Mortg., Inc., No. 1:09-cv-00300 (D.N.M.) ($11.25 million recovery); Goldstein v. Tongxin Int’l Ltd., No. 2:11-cv-00348 (C.D. Cal.) ($3 million recovery); and Lane v. Page, No. Civ-06-1071 (D.N.M.) (pre-merger increase in cash consideration and post-merger cash settlement). Danielle has been named a “Next Generation Lawyer” by The Legal 500 and was named one of “Five Associates to Watch in 2012” by the Daily Journal. In 2011 and 2010, she was nominated for the San Diego Daily Transcript’s Top Attorney and Young Attorneys awards, respectively. In addition, Danielle has been named a Future Star by Benchmark Litigation. Danielle is a frequent lecturer on securities fraud and corporate governance reform at conferences and events around the world. Her recent speaking engagements include the ABA 5th Annual Western Regional CLE Program on Class Actions and Mass Torts on June 22, 2018 where she spoke about The Proliferation of Class Action Opt-Out Litigation: Prosecuting, Defending, and Settling Direct Actions. In March 2018, Danielle also taught a course at UC Berkeley School of Law on Securities Litigation: The Plaintiff’s Perspective. Danielle earned her Bachelor of Arts degree from the University of California at San Diego, with a major in U.S. History and a minor in Political Science. She earned her Juris Doctor degree from the University of San Diego, where she was a member of the San Diego Law Review and received a CALI Excellence Award in Statutory Interpretation.